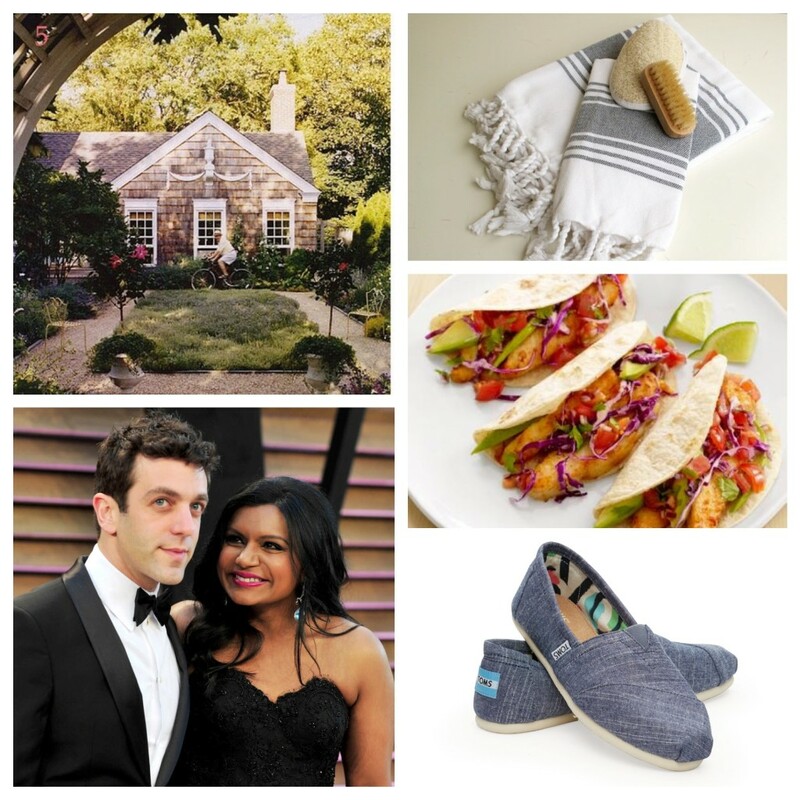 Here are a few of my favorite Memorial Day things…Let the Summer Commence!!! This seems like an adorable spot to spend Memorial Day weekend – maybe bike up the road to meet some friends for lobster rolls. Fouta: Beach towel, picnic blanket, and firepit shawl: a fouta may be your most versatile memorial day item. Here’s a lovely shop on etsy , Loveee, for all of your fouta needs. Baja Fish Tacos: Nothing puts me in a beachy mood like fish tacos especially when served with a mai tai. Here’s a list of safe, sustainable fish. I find this a helpful resource since it’s hard for my brain to keep track. Chambray Toms: I still have the first pair of toms that I purchased in 2007. These are the perfect shoe to slip on this summer kickoff weekend. As a bonus, toms just donated nearly 300,000 shoes to children all over the world and will continue to donate shoes for each one purchased; an inspiring company founded by a very cool guy, blake mycoskie. Mindy Kaley & B.J. Novak’s book: It’s not out yet so I won’t actually be reading it this weekend, but I happened to just read about it.. According to the NY Daily News, of which I am in avid reader 😉 , these 2 are receiving a hefty amount for a book about their complicated relationship. Back pain is a common aliment during pregnancy. However not all back pain is muscular. If you are feeling some aches in your lower back in addition to a sharp, shooting pain from the buttocks down the back of your leg, you are experiencing sciatica. 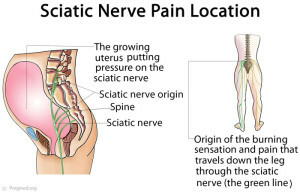 The sciatic nerve spans that same area. When extra weight, whether from the baby shifting her position or from an expanding uterus, resides on that nerve this compression results in that sharp pain down your leg. Hot & Cold Compresses. Alternate using a heating pad to increase blood flow and an ice pack to reduce inflammation whenever you are sitting for longer periods. Acupuncture will improve circulation, relax muscles, and enhance the flow of energy. Prenatal Massage: If you can squeeze in a massage every once in awhile this will loosen up the muscles in the lower back and alleviate the tension surrounding the nerve. Swimming: If you haven’t tried swimming during your pregnancy start now! A low-impact exercise that feels so great on a pregnant body making you feel almost weightless. Change up position: Lie on your side with a pillow between knees – better pelvic alignment and relieve pressure off nerve. Yoga: Try the following poses to take the pressure off the nerve. Cat/Cow: Do a series of these for 5 breaths to find length in the spine. Janu Sirsasana: Take the straight leg out to 45°, use a strap and sit on a blanket to support lower back. Gomukhasana: If your hips are tight, try this with the bottom leg out straight or prop your sitting bones on a blanket. Child’s Pose: A gentle pose to open the hips. Supported Supta Baddha Konasana: aaahhhhh, magical restorative pose. Stay here all day if you like. Navigating core work during pregnancy is as confusing as determining which seafood is safe to eat. There are so many rules and restrictions that on the one hand it’s tempting to toss your arms up and forge t the whole thing. On the other hand, it may be tempting to continue with your standard core strengthening routine without properly modifying. Do neither of these things. I’m all for pregnant women staying fit and strong and being their badass selves, but no one wins if you don’t modify your ab exercises. Don’t get me wrong. A strong core benefits a woman from the 1st trimester into her postnatal body. With those muscles in working shape you can avoid many of the pains of pregnancy especially in the back which becomes more vulnerable as your belly gets progressively bigger. You will also bounce back to your pre-pregnancy shape faster. Yes, I know we need to be content with our new bodies but honestly wouldn’t we prefer to have some elements of the former one. Therefore, it’s important to understand which muscles we can continue to strengthen and which ones need a break. The illustration below depicts the shifting muscles in the changing body, as well as emphasizes (irrelevantly I might add) the changing breasts. Way to rub it in… It does offer a nice visualization of how the muscles rearrange pre, during, and post pregnancy. 1. Breathing: I want you to breath. It’s critical. Many abdominal exercises involve lying on your back, which puts pressure on the vena cava and thus slows blood flow to the baby and to your heart. 2. 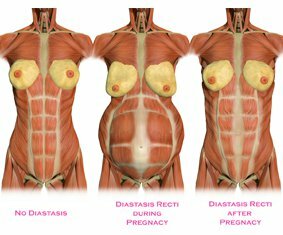 Diastasis Recti. I already mentioned this above – stay away from traditional sit-ups and crunches. 3. Body image. We have to let go a little bit of maintaining our previous figure. Staying fit, healthy, and strong is important. Putting pressure on ourselves to maintain 6 pack abs is an added, unnecessary burden when you already have some big life changes. In the 1st trimester, you are (with the okay of your doctor) safe to continue with standard abdominal work. Once you are in the 2nd trimester, modifications become necessary. The following poses offer safe, challenging exercises to strengthen the core. Bird Dog: Come to all fours on mat with shoulders over wrists, knees hip-width apart and spine neutral. Extend left arm forward and right leg back. Take 5 breaths and then switch sides. 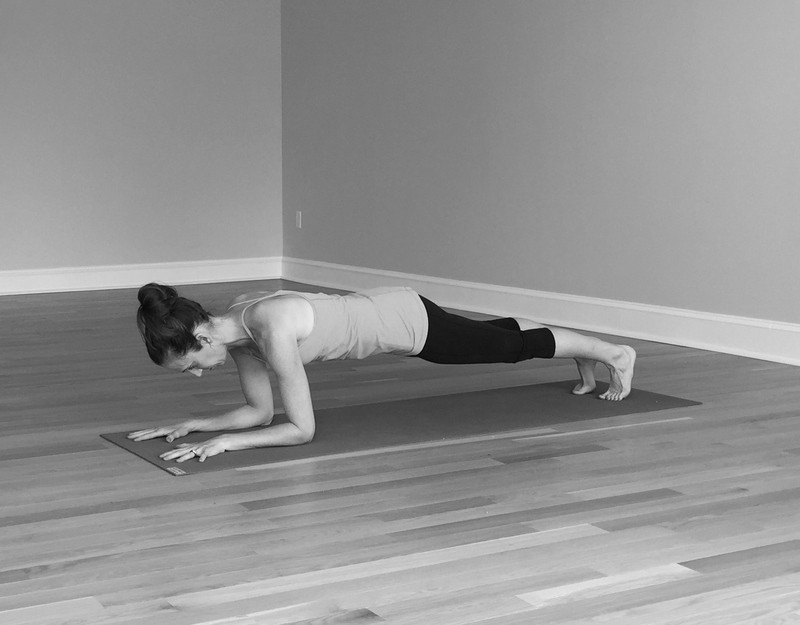 Forearm Plank: You can modify by coming to your knees or coming to a high plank. Side Plank: Extend the top leg and bring bottom knee to mat. Modified Navasana: Keep your forearms on mat behind you. With bent knees lift legs to tabletop so your calves are parallel to mat. alternate lowering one foot and tapping toes to mat and bringing it back up to tabletop and lowering other foot.